Petrana is an artificial personal assistant who talks to the computer user in spoken English and operates computer applications for the user easily, comfortably, and enjoyably, giving the user free use of his or her hands and freedom of movement. Combine Petrana with a wireless microphone system and projector for maximum comfort and freedom of movement. Succeed by uniting the impact of speech with the power of e-mail. Communicate faster and easier than typing. The impact of the spoken word often makes the difference between success and failure. The Petrana Audio Mailer is an innovative audio messaging system with automated file attachment. 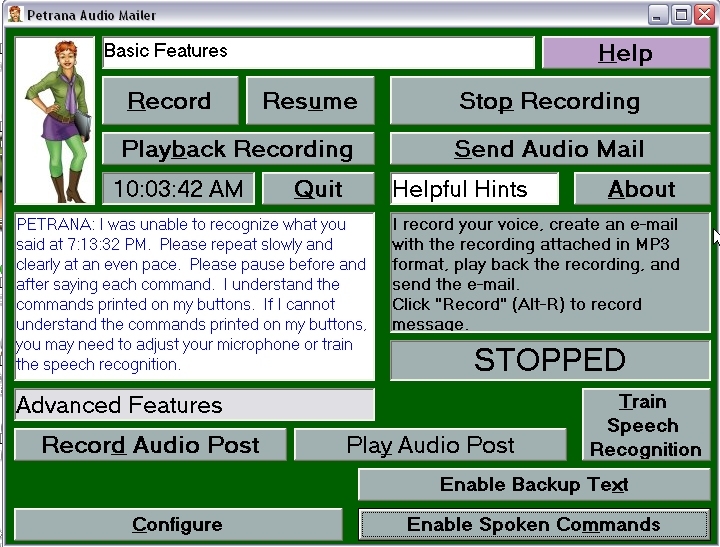 The program records your voice, creates an e-mail with the recording attached in MP3 format, plays back the recording, and sends the e-mail via Microsoft Outlook or Outlook Express using four spoken commands, button clicks, or keystrokes. The program uses Microsoft Speech and runs on any Windows XP PC. The Petrana Audio Mailer detects MS Speech on computers and installs MS Speech 5 if it is not already loaded. PLEASE NOTE: See installation instructions for detailed information on installing and getting started. TO PURCHASE: Please download and install the trial copy of the Petrana Audio Mailer. When you run the trial version, Petrana will display a registration number. Please send us the registration number with your purchase payment using the Optional Note provided by the PayPal system. We will send you a unique Unlock Code generated from the registration number and a User Name that will enable you to run the program on your computer. The Unlock Code is unique to your computer. You should receive your Unlock Code within 48 hours. Click on the Buy Now button now to purchase using your credit card or PayPal account. The Petrana Presentation Controller 1.2 (Beta) enables the presenter to control Microsoft PowerPoint presentations entirely by voice command. The presenter can create voice cues to control the presentation including spoken shortcuts to jump to slides in any order. The presenter can skip over sections that do not interest an audience, jump to detailed sections of interest to specific audiences, bring up detailed slides answering audience questions, open external files such as video or spreadsheets, all using user defined voice cues. The program uses Microsoft Speech and will run on any Windows XP PC. A free trial version of the Petrana Voice Commands for Outlook Express is available for download. Trial version will stop working after 100 uses. © 2007 GFT Group Inc., P.O. Box 66, Mountain View, CA 94042. All rights reserved. Unauthorized redistribution of this document is prohibited.